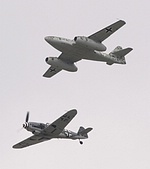 Chris Gee from New Zealand shares his view on the ILA Berlin Air Show 2008 as well as these excellent shots. . In 1909 the first "Internationale Luftschiffahrt-Ausstellung” or International Airship Exhibition, was held in Frankfurt, Germany, where the Zeppelins and pioneering aircraft of the day were showcased to an enthralled public. 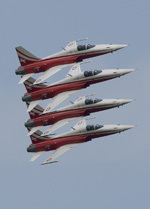 The ILA is still held every two years, making it the world’s oldest airshow. Located at Schönefeld Airport in Berlin and Covering 250000 sqm, with 331 aircraft on display and an attendance of 241000 public and trade visitors it bears little resemblance to its humble beginnings. Indeed it shows just how far aviation has come in the last 100 years. An attendee from 1909 transported through time to the ILA in 2008 would find the fast jets, helicopters and mighty behemoths of the 21st century beyond comprehension. The ILA this year also marked the 60th anniversary of the Berlin Airlift when over 200,000 flights were made by the air forces of the US, Britain, France, Australia and New Zealand to supply the western sector of Berlin during a blockade enforced by the Soviet Union in 1948. This was the largest humanitarian airlift of all time, and was represented at ILA by a DC-3 ‘Candy bomber’, an RAF C-47 Dakota and a Junkers Ju-52. The USAF also deployed its C-17 named “The spirit of Berlin”. Many veteran aircrews from the airlift were on hand to tell their stories, as were some of the 19,000 German women who quickly constructed what was then the longest runway in Europe at Tempelhof Airfield to facilitate the 2500 landings a day. Recently the ILA has begun involving an international partner for the expo, and this year it was the Indian aerospace industry that stepped up. 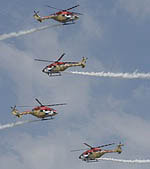 The Indians were well represented at the show, with their own expo pavilion, and demonstrations by the new Hindustan Industries HAL ‘Dhruv’ Helicopter. 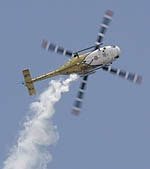 This was displayed in spectacular fashion by the Indian Air Forces ‘Sarang’ Display team, using five Dhruv’s. Indeed they became a highlight of the show with their formation flying, aerobatics and close passes, as well as their fantastic colour scheme. The real treat for many aviation enthusiasts was to be the daily display by a restored Me-109 with one of five new build Me-262 replicas. Seeing them fly in formation was an amazing sight to say the least. Unfortunately on the first trade day of the airshow the Me-109 had an accident upon landing after its one and only flight with the Me-262. It performed a ‘ground loop’ which apparently is a historical problem with these aircraft due to the narrow track of its main landing gear. There was a rumour that almost as many pilots were killed landing the Me-109 than in combat… A Spitfire MK VI from the RAF Memorial Flight and a P-51D Mustang also flew at the air show and it was hoped they could have flown together. This was not to be. The Me-262 was a technological marvel in its day, being the world’s first Jet fighter, the first fighter with tricycle undercarriage and the first aircraft to use split-flaps. It flew only once more during the week. 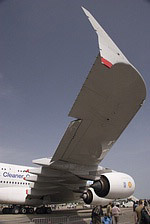 The latest 21st century technological marvel was also flying at the ILA 2008, the Airbus A380. The size of this aircraft cannot be fully appreciated until you see it towering over the C-5 Galaxy it is parked next too… For such a large aircraft it was very quiet taking off, and once in the air it proved highly manoeuvrable. Its low speed / high alpha pass was bewilderingly slow with the aircraft seeming to defy gravity. The Airbus pavilion provided a cut-away model of the A380 showing its internal layout options. It looked very roomy inside, and the First Class cabins had more in common with a small studio apartment then a seat on an aeroplane. 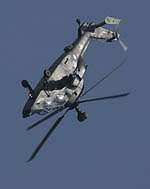 Of special interest to me as a New Zealander was the display by the NH Industries NH-90 Helicopter. New Zealand has just signed a contract to buy 8 of these incredibly capable machines to replace our venerable UH-1 Huey’s. 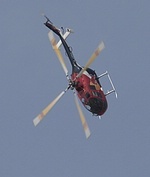 This helicopter put on an excellent display, as is an obviously powerful and nimble helicopter. A Lengthy discussion with the pilots at the static display yielded some very interesting information regarding the machines capabilities over the UH-1, which the Germans also operate. While the UH-1’s require an average of 2.5 man hour’s maintenance for every 1 hour of flying, the NH-90 requires only 15 minutes. 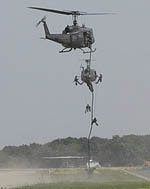 Also the German UH-1’s have an availability rate of 55%, while they expect at least 95% from the NH-90. Its interior is very roomy, with every seat crash-resistant. The rear doors also offer excellent access for men and equipment. Another new generation helicopter on display was the Eurocopter Tiger, in the German UHT (Anti-Tank) version. This is very formidable looking beast whose hinge-less rigid rotors provide stunning manoeuvrability performing barrel rolls, slow loops and back flips. The Tiger also has a very long range and loiter time over the target. Its mast mounted Optronics system enables it to hide behind obstacles, and is entirely passive, being undetectable by modern warning systems and countermeasures. 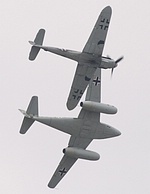 The German Defence Forces were at the show in force, both in the static displays and in the air. As well as individual displays by the Eurofighter Typhoon both the Luftwaffe and the Bundeswehr put on spectacular capability displays. The Luftwaffe display took the form of an “intercept” of one F-4 Phantom by four Eurofighter Typhoons, who forced it to ‘land’. This was followed by four IDS , two SEAD and two RECCE Tornadoes securing the airfield, so that a pair of C-160 Transalls could perform their mission. One dropped humanitarian supplies, while the other, escorted by two UH-1 Huey’s, landed on the runway and disgorged two platoons of soldiers, who surrounded and arrested a group of plain clothed ‘terrorists’ who ran onto the runway from the audience. 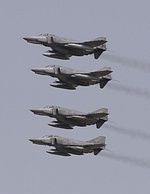 During the three non-public trade days of the airshow there was also a fly past by four F-4 Phantoms, which the Luftwaffe still have in-service for another few years until they are replaced by the Eurofighter Typhoon. 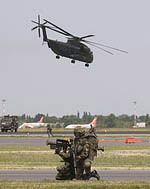 The Bundeswehr display consisted of a mass airborne insertion of men and equipment into the ‘hostile’ airfield. With two Tiger-UHT attack helicopters circling the perimeter a total of no less than 16 CH-53, 2 NH-90 and 2 UH-1 helicopters dropped total of almost 60 men, 6 Weasel Tanks, 6 Mungo Vehicles and two squads of special forces, either from within the airframe, as an under slug load, or fast-roped. Within 10 minutes of the helicopters appearing over head all the soldiers were mounted in their vehicles and driving as a convoy past the audience. It was amazing just how quickly so much fire power could be bought into the battle, Including ATGM equipped Weasels and an Ozelot Surface to Air Missile launcher. 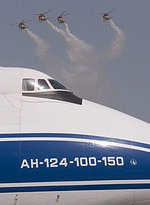 A welcome surprise to many at ILA 2008 was the arrival of the mighty Volga-Depner Antonov AN-124 on the second trade day. This beast can carry over 100 tons of cargo to anywhere on the globe. Built as a strategic military transport it requires very little runway for its size, facilitating its widespread use as a commercial cargo hauler. Indeed the aircraft has become so successful in this role that entirely new and modernised airframes are to be built, using western avionics and engines. This aircraft spent only five hours on the ground at Schönefeld, and after making the announcement that it would leave at 7pm the authorities gave up trying to get the photographers and enthusiasts to leave when the show closed at 6pm. Watching the AN-124 sit at the end of the runway at full power for four minutes and then perform an earth shattering short takeoff was the highlight of the whole show for me. 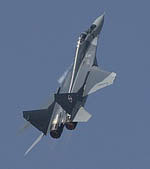 It is the Fast Jet displays that attract many to the modern airshow, and ILA was no exception. As would be expected it was the Eurofighter Typhoon that stole the show on this front. This aircraft is the pinnacle of European technology, and its display proved this. Its ability to face its nose in a different direction than it is travelling without noticeably loosing airspeed was evident in its bizarre ‘outside rolls’, as was its massive rate of climb and tight turning capability. One of the most visually pleasing fast jet displays came from the Dutch Air Force F-16 Display team, with their beautiful aircraft resplendent in its “Metallic Stripe” paint scheme. Unfortunately the strict German regulations forbade any of the solo fast jet displays from using flares, which usually forms the backbone of this aircrafts display. A welcome pair of visitors to the ILA Air show was an upgraded Mig- 29AS of the Slovak Air Force, and an ex- East German Mig-29 operated by the Polish Air Force. 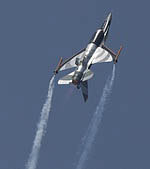 This aircraft flew an exhilarating display with a rapid takeoff straight into a tight turn away from the audience. The Mig-29 proved very manoeuvrable, powerful and LOUD! ‘The Blades’ performed daily at ILA, with an exhilarating display of precision formation flying and aerobatics in their Extra 300 Aircraft. Made up of ex-Red Arrows pilots they are actually the worlds one and only ‘Aerobatic Airline’, being certified to carry passengers! They offer corporate ‘flying days out’ as well as aerobatic instruction. The highlight of the team aerobatic displays however was the Patrouille Swiss team with their brightly painted F-5E Tiger II jets. The team were forced to change their display to fit into the tight regulation forced upon the air show by the German authorities, and the teams commentator apologised profusely for this. Their display proved amazing as it was, with their ‘Shadow’ pass and flare- firing finale being the highlights. Based out of Salzburg Airport in Austria, the Red Bull sponsored ‘Flying Bulls’ displayed three aircraft at this years show. Their 1958 Douglas DC-6B was beautiful to watch in the air, and was actually the personal VIP transport of the Yugoslavian dictator Tito. The carpet inside this aeroplane is so rare and expensive that you need to wear special ‘over-shoes’ to board the aircraft. 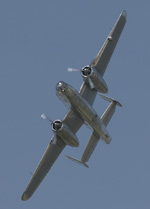 They also bought their North American B-25J Mitchell, which looked lovely with is gleaming silver finish and clean lines. It performed a spirited display while the commentators told the story of the Doolittle Raids on Tokyo. 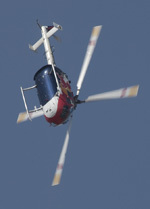 The main star of The Flying Bulls was Rainer Wilke flying the BO-105. The aerobatics this world championship winning pilot flew in this helicopter were just beyond belief… The double back flips, diving barrel rolls and inverted spins made this 2-ton Helicopter look like a radio controlled toy gone crazy. 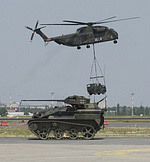 Another very interesting Helicopter displayed at ILA 2008 was the Mil Mi-24V Hind of the Hungarian Defence Forces. This powerful and infamous machine was painted in the “Golden Hind” scheme depicting a beast from Hungarian mythology. 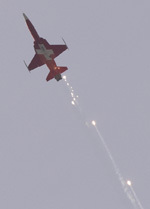 It flew every day and gave an excellent aerial display, including firing salvoes of self-defence flares. When it was not performing it made for a star attraction of the static display. 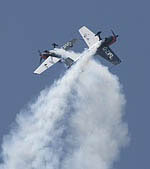 There were a few real treats and rarities that flew at ILA air show this year, one being the OV-10A Bronco. This Vietnam era aircraft was designed as a COIN (counterinsurgency) and FAC (Forward Air Control) Aircraft and there are not many flying today. Indeed this example is the only one flying in Europe. The Bronco was used by the Luftwaffe as a target tug, and this example has been preserved and displayed by the Museum of European Aviation in France. This rather odd looking aircraft gave an excellent display. Another rare aircraft that flew was the two seat version of the PZL 106 AR Kruk. This ‘Flying Tractor’ gave a great demonstration of its STOL performance and fire-fighting capabilities. It certainly looked strange with it extra cockpit added on the front of the fuselage to train new aircrews. One of the Stars of the Air show was Peggy Krainz of the Wing Walkers and their Boeing Stearman E75, flown by her partner Fredrich Walentin. Unlike most modern wing walkers who are attached to the aircraft, Peggy performs totally freeform, with no harness connecting her to the aircraft at all. Battling a 250km an hour wind she climbs from the cockpit onto the wing and holds on for dear life. 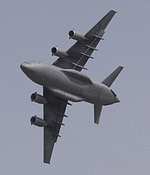 The United States Air Force deployed numerous aircraft to the show, including two that flew air displays every day, the B-1B Lancer and the C-17 Globemaster. There is no sound quite like the B-1B with its four General Electric F-101-GE-102 turbofan engines with afterburners giving over 100,000 pounds of thrust on takeoff. It performed low passes over the crowd with its variable geometry wing in various positions before landing. The C-17 gave its standard display of a very short take off and even shorter landing, reversing back up the runway to display is ability to land on short unprepared airstrips. For the static display the USAF flew in two F-16C Fighting Falcons, an F-15C Eagle, F-15E Strike Eagle, C-5A Galaxy and a KC-135 StratoTanker. Many other countries contributed to the static displays this years, including the French Air Force ( Dassault Rafale B), Hungarian Air Force (Saab Gripen C) and a NATO (Boeing E-3C Sentry AWACS). Embraer, Diamond Aircraft, Cessna and Cirrus all had large static displays selling their products, with the new Cirrus ‘The Jet’ being of particular interest. There was also a dedicated Heli-Expo, with the new Neo kitset helicopter on display. Of course the ILA is much more than just an air show, it is also a massive Aviation and Aerospace Expo. For six days a record total of 1,127 exhibitors from 37 countries presented their products and services to 120,000 trade visitors, and there were over 100 conferences and workshops on new technologies. This year there was over five billion dollars worth of business undertaken at ILA, most of this made up by the Gulf Air (Qatar) order for 3.5 Billion dollars worth of new aircraft from Airbus. The theme of the expo this year was “Greener skies ahead – Low emission aviation”, and many companies had their new innovations on display, including Airbus with their A320 Fuel Cell Demonstrator. Over the years the ILA Air show has grown considerably in its size, attendance and importance, and will soon rival Farnborough as the worlds premier place to do your Aviation business. Overall this air show was one of the best organised and executed I have been to. However Schönefeld is to become the site for the Berlin Brandenburg International Airport, the new central hub for Germany. This created the only negative issue of the show since the construction work in progress forced ILA to share the single runway with the scheduled commercial traffic. This led to many delays in the displays, and also forced the organisers to create a separate airspace for displays across the other side of the airport while the runway was in use. This meant many of the displays appeared as mere dots visible only to those with large zoom lenses or binoculars. But by the time the next ILA comes around in 2010, there will be three runways, and I am sure another spectacular Airshow. If you have the means to get there… go!